Happy Holidays from Webvision. We wish you a happy, healthy and productive holiday season and New Year. 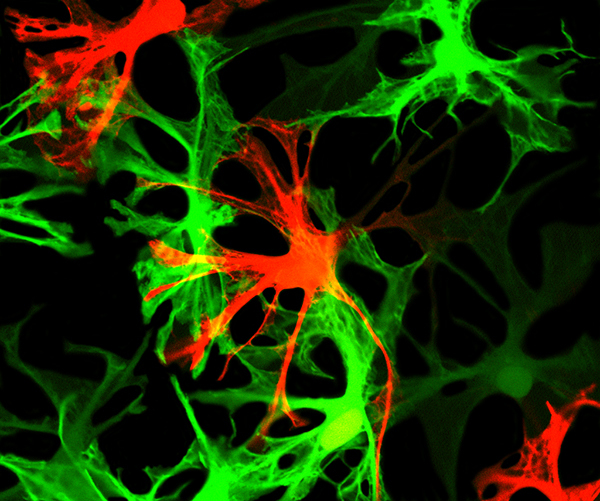 Gabe Luna from Steve Fisher and Geoff Lewis’s retinal cell biology group at UC Santa Barbara Neuroscience Research Institute provided this festive laser confocal image of a wholemount from a normal retina with dye-filled retinal astrocytes using Lucifer Yellow (green) and Alexa Fluor 568 (red) which were used to examine the spatial organization between individual astrocytes.